While I always try to check my post spellings and punctuation are correct before I post initially, from time to time I like to read back [in build threads particularly] and re-jig a fews things - either to make them read more clearly, or to add bold text or extra/alternative pictures and captions etc. Recently when I've tried to do to this on both some older posts, and ones just made a day or so previously, I've had a message pop up saying "this post cannot no longer be edited because too much time has passed or it may have been moved" - can admin advise why this might happen? Does it have something to do with the number of characters and/or photos in each post? or the number of likes a post has? or if someone has quoted that particular post for example? Or is it just a glitch?! Any advise is welcome, thank you! I had that happen too. Particularly on lengthy posts. Next time you have this, could you leave the post unedited and post a link to it here please. Was this to do with someone having a paddy and deleting all their old messages and threads before leaving? I also occasionally encounter this and the timeframe does seem inconsistent. No - we took a vote on restricting the editing timeframe but it was a tied vote and it wasn't implemented. I've had a message pop up saying "this post cannot no longer be edited because too much time has passed or it may have been moved" - can admin advise why this might happen? This happens to me quite frequently and as Juggular says, it seems to be more prone to happen when trying to edit lengthy posts. In my case, it usually happens when I re-read, change and try to save posts seconds or few minutes after first posting. I just logged in as madd_monster (a mate's account, he doesn't use the forum any more) as there's no admin rights on that login and edited this post from 2003. However, I can't do that with posts that have had subsequent replies (by myself or others) as they would be come disjointed of course. And the post just freezes saying 'saving' - and you have to refresh the window (in the menu bar for example) where it then reverts to the previously saved/unedited example. ...Similarly I can add another photo to that post no problem. The issues I seem to have are changing the format of some existing text - eg. centring it and/or changing the size of the font. 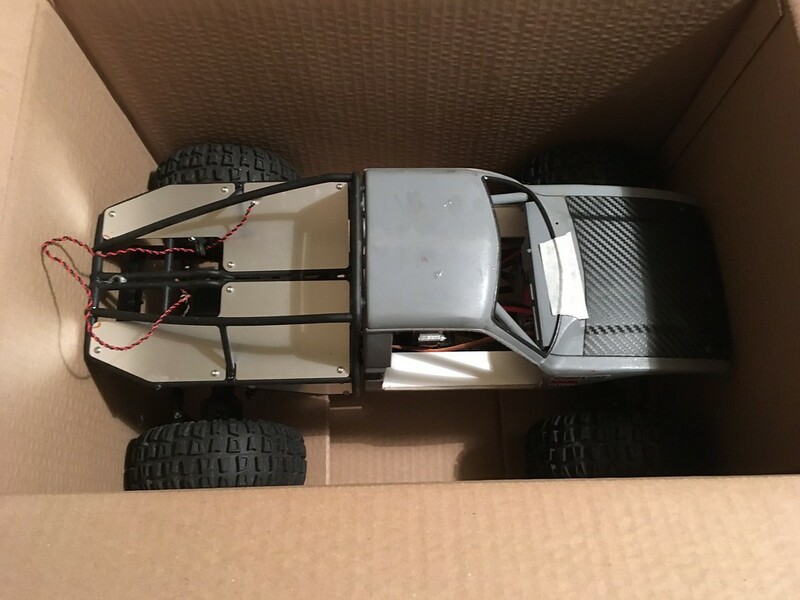 As you may recall, earlier this year we left Louis Willy trying to work out if he (or any other driver) might be able to climb into the cab - so in that regard, I thought I might have a go at something that I'd seen on other chassis-cab crawlers and truggies, and cut the doors down to reveal more of the interior. photo. 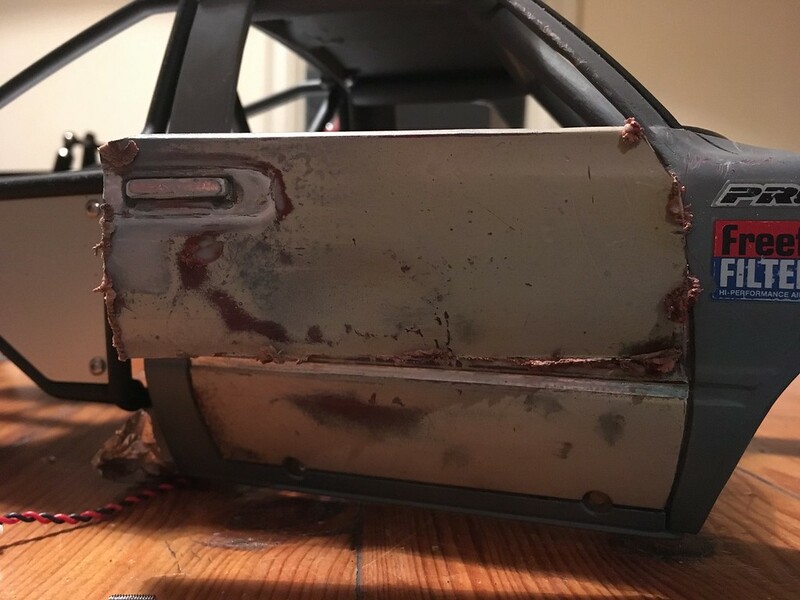 I decided to retain the lower panel of each door, to give structural rigidity - not least for the shell mounting holes - and [for now at least] retain some of the weathered paintwork. photo. modified bucket seat from a Wild Willy 2 shell. photo. from this angle you can't tell he ain't got no legs below the knees! 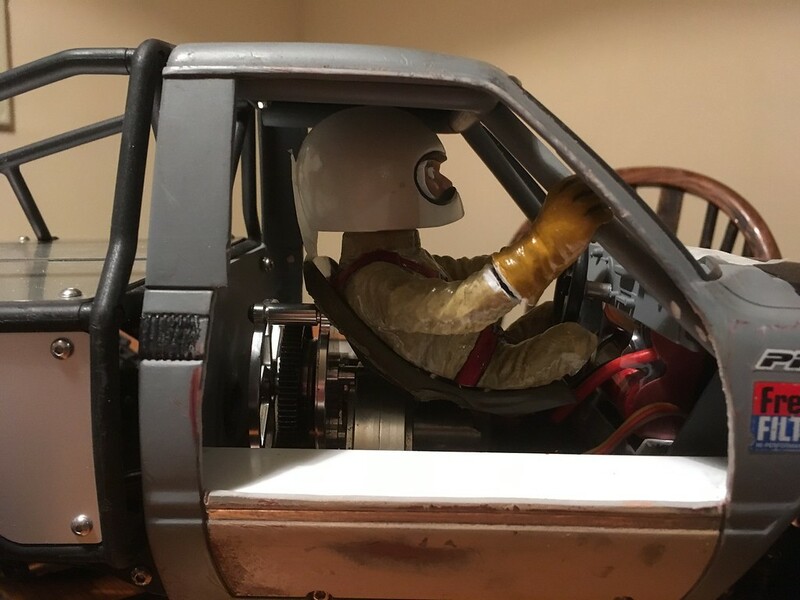 As you can see it's been quite the squeeze to get the Wild Willy 2 seat and driver in the space between the gearbox and the forward bulkhead/battery, and it has meant he's had to lose his boots (for now at least) - but I think the overall effect is still pretty realistic? note. 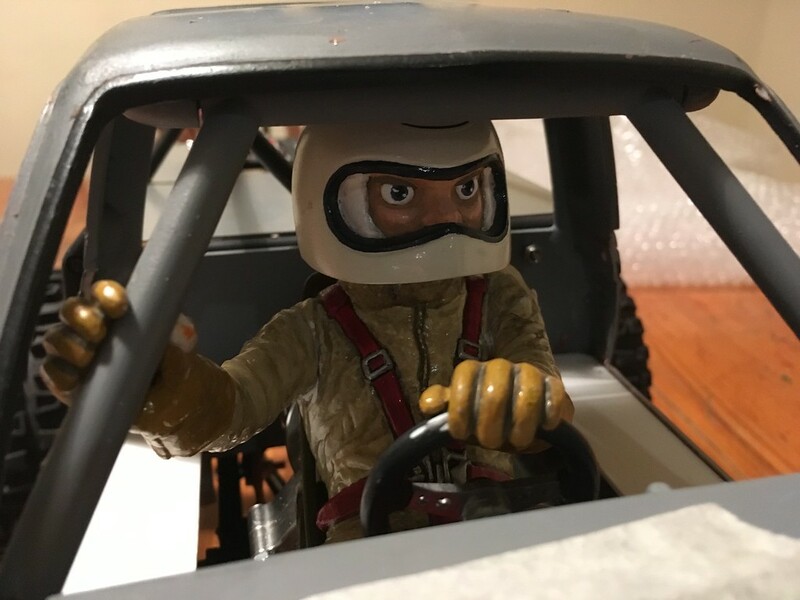 ultimately having him hanging onto the roll-cage means the driver figure will remain attached to the shell even when it's removed for access/servicing - making things very easy in that regard, especially as currently the shell is only attached with four screws (two along each sill). 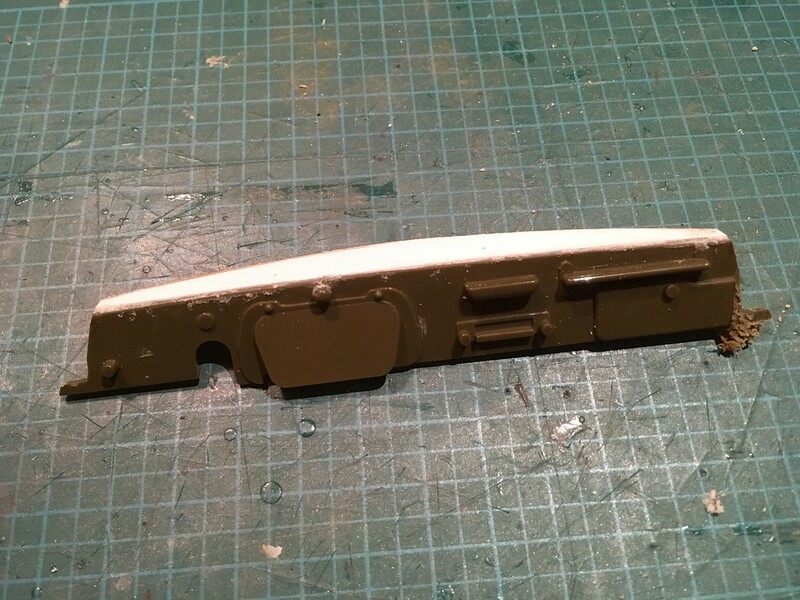 ...and fabricated some deep/wide door sills using styrene which mate up inside with the inner wheel-arches - and will ultimately be covered in [genuine] aluminium tread-plate to keep things even more scale and authentic. The other thing I did which is not really obvious in these pictures is to remount the body a couple of mm lower, using some commercially available body mounts from eBay (designed to mate a Trailfinder shell to an SCX10 chassis) which turned out to be a very similar shape to my 2nd generation styrene mock-ups I'd been using previously. 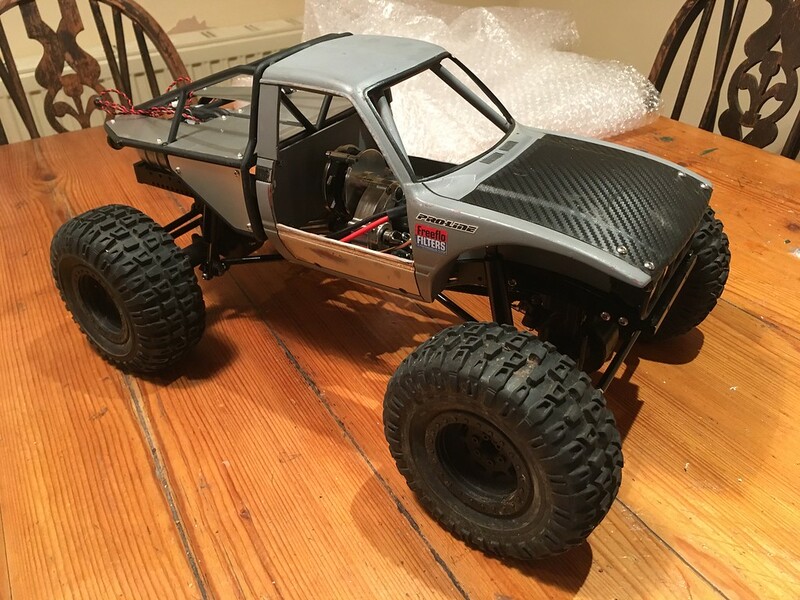 Fortunately I can confirm that the tyres still clear the front arches and rear cage rails, even on full articulation and lock - Result! 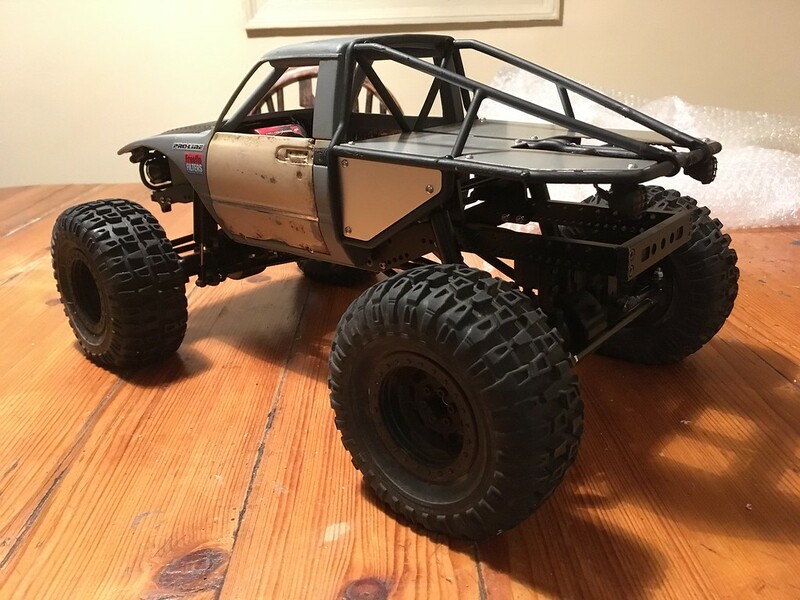 I had also decided to modify the rear cage (sorry, I forgot to take photos of the actual process - but basically, using a Stanley knife, heat-gun and Dr. Dremel) so that there is less overhang at the rear - while retaining the full length of the alloy deck panels that come as part of the Vaterra rear cage kit. Obviously there is still a lot of finishing to do - fabricating some door jams, plus I have some padded roll-cage tubes I want to incorporate as horizontal bars halfway up the door apertures... Then I need to properly secure Willy in the cab and touch in all the paintwork; and also finalise my plan for a rear fuel tank to fill in the space between the cage deck and the chassis rails. 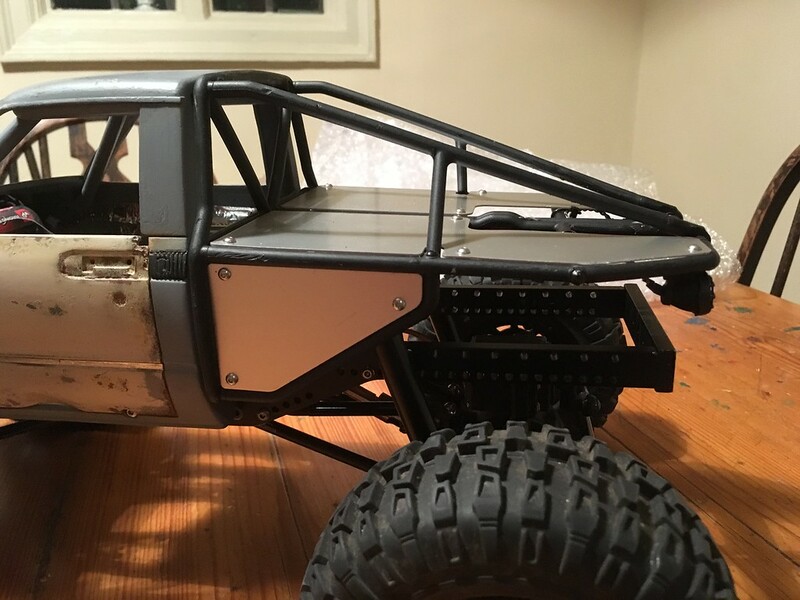 Ultimately, I also intend to add a few scale accessories to the interior and rear deck of the vehicle, although keeping in mind that it's primary function is as an actual crawler, everything will need to remain well tucked in and properly secured in the event of a roll-over. However, for the next few weeks I'm actually going to be busy moving house - so for the time being, Desmond has been boxed up for transit - turns out he's now exactly 12x18 inches! Thanks... yes, as I say, I seem able to make things bold, italic, and even change/add new text - I just can't centre (rather than left justify) or change the size of the font. Did you get blocked on the first edit or after a few? I can't see anything in the settings to indicate it's a deliberate limitation or flood control, will have to look into it further. I think it could be a forum glitch rather than a setting, it's the first time I've seen an option limited to admin. At first I thought it was because I was trying to change too many things at once - but as you say, even doing each edit individually comes up with the same message. Interesting you've found/feel it's due to the length of the post - as I say, with more recent posts I've been able to chop them (that edited/shorter version always saves no problem) and save the second part as a new post, then both can be edited. for info. I haven't tried chopping and saving an earlier post, then trying to paste the cut text back in, as I won't want that to block me from reinstating the original text (for chronological reasons obviously). Yeah, don't edit anything that might need changing back until this is resolved - It's the first time I've come across an admin option that doesn't work (namely editing a post) so it must be something wrong with the forum software as opposed to any rights or limits imposed on non-mod members. I noticed that yesterday I replied on a thread, and went to add a ps paragraph and got the same message, even though the initial post was just short - however it did originally include a youtube link and another URL in it too - so perhaps that has some effect? So I ended up posting my ps as a separate post instead. I went back in to change a word, and it says it's no longer able to be edited? EDIT. Again, it seems the only edit it will allow is for me to select a section and cut a chunk of it out - then it will allow me to save the shortened version, and also make subsequent edits to that shorter version too. I then reposted the chopped section as a subsequent post. Sorry can't see this being fixed in the short term, so the only work around is breaking long posts into smaller ones I'm afraid. Got people looking at it, so if anything changes will let you know. Just reviving this old thread - looks like I'm having trouble again... 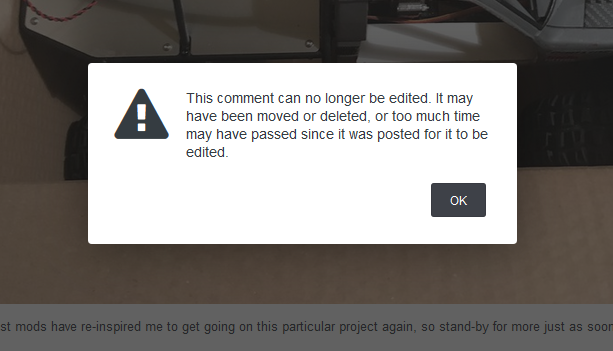 I did the other day while editing my Mega-Bug build thread posts, and sure enough, having trouble again even with this really short post - I'm getting the same message: 'this post can no longer be edited due to being moved or too much time has passed'... even though I tried to edit it almost instantly. Hope you can help Twinset!